What? 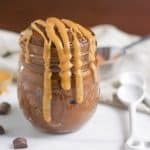 Another peanut butter and chocolate combo recipe?! Who would have thought! 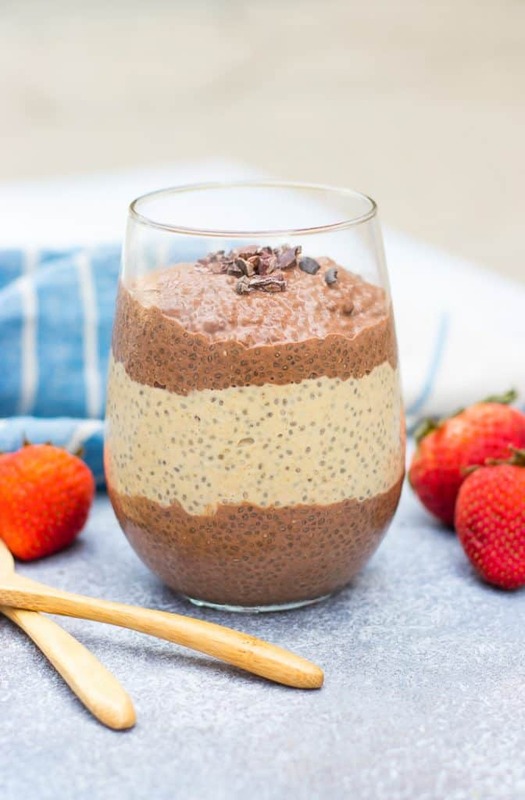 It’s a combo that I have so often–it’s my lifeline I guess and this chia pudding recipe is just another easy and delicious way to enjoy it! I just love it. One of my nephews can’t stand peanut butter and it makes me wonder if we are really related. It baffles me. I also understand peanut allergies are a very real and serious thing so I like to be sensitive to those living with this issue as well. Hopefully, almond butter or another seed butter has become your favorite and you can always sub one of those for the peanut butter. Once you mix it with the chocolate, you can’t go wrong. I will tell you one thing, chia pudding can be very hard for people who have a thing about texture. And there really is a solve for that! You can pop the pudding into the blender and it also becomes a smooth, rich creamy pudding. I usually prefer it that way, but this one I actually loved as is. Again, it must be the peanut butter. Of course it is, who am I kidding. I always have to laugh thinking back to the chia pet days. Who knew these would become such the superfood of the future down the road when we were just sprouting them out of animal shaped pots. But here we are getting ready to have it as a tasty treat! If you are a fan of recipes that are ready overnight–these are for you. I’ve got a super amazing Almond Joy Chia Pudding recipe too if you are feeling adventurous! And take a peak at all the Overnight Oats recipes as well here if ready to go snacks and breakfasts are your thing! In separate mixing bowls, whisk together all ingredients for each of the layers. Once pudding is set, layer into small serving dishes. Garnish with dark chocolate shavings if desired. 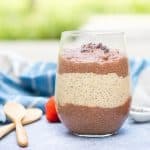 If you don't like the texture of chia seed pudding, before placing mixtures to set in the fridge, blend each in a high powered blender until smooth. Then chill. This looks delicious! I’m definitely going to try it. Been looking for ways to incorporate chia seeds besides smoothies!! Yes! I love them in my oats as well! I’m making this recipe tonight! I have a slight chia pudding addiction since being in the hospital with my daughter. For some reason it was the only thing I ate there! 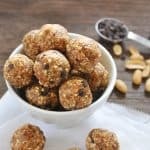 This recipe combines my chia addiction with 2 of my other favorite things. Cue happy dance!!!! Can’t wait to try it. Thanks for sharing! Ha! So glad you share my addiction—to both! Enjoy!!! I’m making this for supper tonight. It looks absolutely delicious. I love Chia puddings! You are ambitious!! Let me know how you like it! I’m with you on chocolate and peanut butter – you can’t get too much of them together. And this is a scrumptious way to enjoy them! It’s kind of hard to trust a human that doesn’t like peanut butter – just sayin!! Especially when it looks like this – yum! Is there anything better than chocolate and pb… I think not!!! It’s the perfect combination of sweet and salty and gets me every time! LOVE everything about this and it has my name all over it. Love chia pudding and chocolate and peanut butter combos are my weakness. I thought this would be up your alley. Same, not for everyone but def for me! Thanks so much Julie, and I have to agree!!! 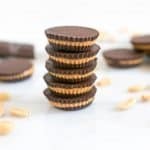 Chocolate and peanut butter are a match made in heaven! This sounds amazing! I love chia pudding and I have not yet thought to make with peanut butter – why I don’ t know! This sounds great! Peanut butter makes everything better right?! There’s nothing I love more than peanut butter and chocolate…my absolute fav since childhood. Can’t wait to have this for breakfast tomorrow morning!